Here's everything you need to lock down the passing game, stuff the run and completely DOMINATE your opponents! The 4-3 defense is a football staple. A classic formation that's used by championship teams at every level.... from Pop Warner to the Pros. It's great for slowing down the inside running game. You only need two defensive linemen, your tackles, and one legit linebacker in the middle to stop your opponent’s downhill runs. You don't HAVE to blitz to create pressure. The offensive linemen will be occupied with your tackles and ends, so your linebackers can flow more freely to the ball on running plays… or assist in pass coverage as needed. It's effective against all the modern offenses. It’s a natural fit to stop the Wishbone, I, Wing-T, Split Back Veer… even the Spread. And because of the flexibility of the 4-3 and multiple coverage schemes, offenses can't just isolate a particular area, or try to take advantage of a weak defender. You don't need huge, powerful kids to make it work. The keys to a successful 4-3 are quickness and tenacity. As long as your kids can close to the ball aggressively and with solid fundamentals, you'll have a great chance of shutting down any team in your league. It’s simple to learn, easy to teach, and FUN for your kids to play. Once your team learns the base alignments, assignments, and reads (which you can do in one 90 minute practice). 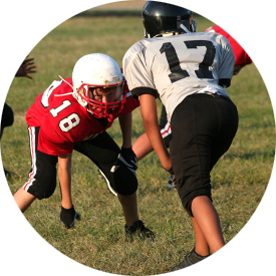 They can become very aggressive in their play… and start ATTACKING the ball with blitzes and line stunts. Despite its popularity, very few coaches truly understand how to tap into the true power of this defense. And if you're new to coaching, the whole thing can be a bit overwhelming. That's why we created the Ultimate 4-3 Defense Playbook. Inside, you'll discover a simple, step by step formula for installing and implementing a top notch 4-3 for any competitive level. It's packed with detailed instructions, simple diagrams, and "quick-learn" coaching pointers that you can take right to practice. 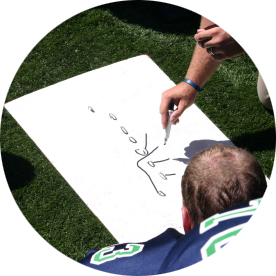 The playbook starts with a quick primer on the 4-3, including alignments, assignments and gap responsibilities for every position on the field. You'll also learn exactly what skills to look for in an ideal 4-3 lineman, linebacker or defensive back. Next, we'll dive into coverage schemes. You'll learn exactly how to lock down the passing game with three man to man coverages and three zone coverages. In this section you'll discover nine game-tested man blitzing schemes, so you can get more penetration into the backfield, create havoc, and force tons of turnovers! Zone blitzing is when your d-lineman pretends to blitz, then drops back into pass coverage to replace the spot vacated by a blitzing linebacker or defensive back. You'll learn nine zone blitzing schemes to disrupt your opponent's game plan, keep 'em guessing, and cause more turnovers! So You Can Start Using These Plays Tonight! To shorten the learning curve and really make sure you and your players "get" this stuff immediately, every scheme is explained with detailed diagrams and "brain dead" simple coaching tips and pointers. Whether your opponent is running a Wing T, Spread, Split Backs, I-Form or Double Wing... or anything in between... your players will know exactly how to throw a wrench into their offensive strategy and force them into bad decisions, low-percentage plays, and costly turnovers. 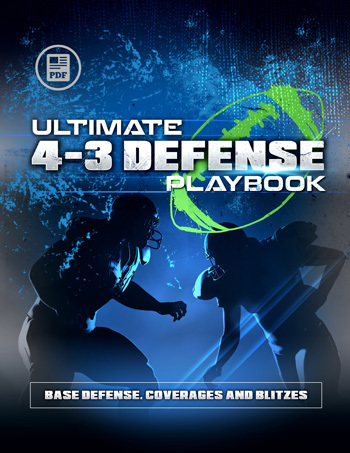 The Ultimate 4-3 Defense Playbook is delivered to you in PDF format, so you can get instant digital access... right over your computer screen, smartphone, tablet, or eReader... from anywhere in the world with an Internet connection! That means you can download the plays to any device (or print them out) and bring them to practice tonight! And that's not all. 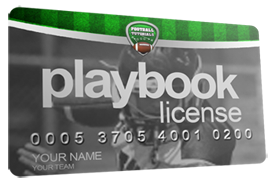 If you're one of the first 500 coaches to order this month, you'll also get two additional bonuses valued at $59.94! These one-page printouts illustrate all the alignments and positional responsibilities for each section of the playbook. 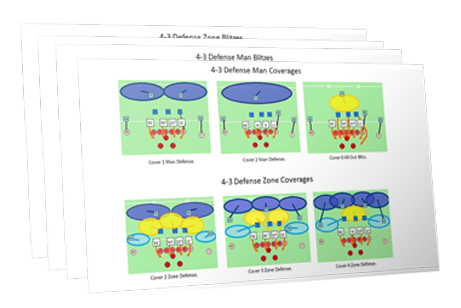 You get 4 basic alignment diagrams, 6 coverage diagrams, and 18 blitzing diagrams. It's a perfect "quick-reference" for your coaching binder, a handout for getting new coaches up to speed, or giving kids "football homework" they can work on at home! This package could easily sell for $47 or more. Remember, you're getting a complete guide to installing a killer 4-3, including 6 coverages, 9 man blitzes and 9 zone blitzes. Plus the Team License and Cheat Sheets. Anyone who can afford to invest the price of a fast food dinner and take the time to learn these techniques… can immediately and dramatically improve the their team's defense! So if you're serious about becoming a better coach, and if you would like to instantly have a proven plan to develop a top notch defense and win more games, click the Add to Cart button below now. Guarantee #2 - If you actually follow this system and don't see an immediate improvement in the way your team plays defense, I'll actually refund TWICE your money. All I ask is that you give me an honest effort. It's just 46 pages. Short enough to read in one sitting. Time is very much "of the essence." If you want to build a championship-level defense this season, you need to start right now. Your package is waiting for you to claim it. Just $7 gets you instant digital access so you can start using these plays tonight. 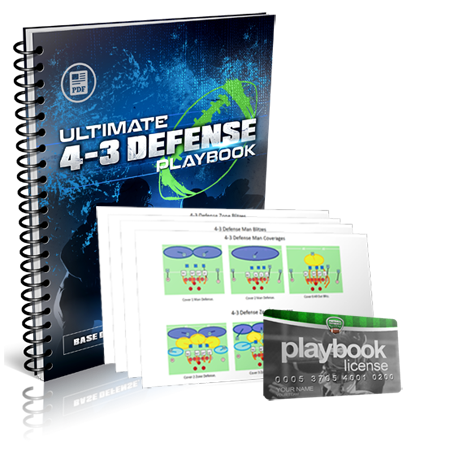 Just download the Ultimate 4-3 Defense Playbook you'll get instant access to a complete defensive system you can start using today!